So, you’ve chosen the perfect Walt Disney World Resort for your family’s vacation. Wonderful! That’s no small feat considering the dizzying array of fun choices on the huge property. Your next decision as you dream about Character, Signature, and quick Service Dining, is the Disney Dining Plan that will work best for you. This is the tenth year that Disney has offered Dining Plan options to add to vacation packages. They have proven very popular for good reason. If you know how to maximize your dining credits, and you know I’m going to help you with that, you can save significant dollars on Disney’s food and drink choices! Most Disney World guests do choose a Disney Dining Plan. The most popular Dining Plan, called Plus Dining, offers each guest one Table Service meal (this can be a sit-down and order off a menu or buffet), one Quick Service meal (order at a counter) one Snack and one refillable drink mug for use at your resort per person per night of your stay. This plan is currently $60.64 per adult per night of your stay and $19.23 per child ages 3-9. Children under 3 eat FREE. You will quickly find that this price point is a much better value than trying to eat the same offerings and paying out of pocket every day. Many character buffets cost almost this much! I’ll be happy to explain it more! I estimate that 80% of my families choose this plan and always select it on repeat visits. The Quick Service Dining Plan is for families on the go who do not want to stop for Table Service meals! $41.99 per adult and $16.03 gets you two Quick Service meals and one Snack per night of your stay. You also receive the refillable drink mug for use at your resort. Remember, character dining is Table Service so this plan does not work well for families who want to do any character meals. Young couples traveling without children and on a budget appreciate this plan. The Deluxe Dining Plan is for foodies. Disney has some excellent restaurants and this plan is for guests who like to relax and enjoy their meals. Character dining, Signature dining and very few Quick Service meals are the reasons to choose this plan. At $109.53 per adult and $29.86 per child, it is a fantastic value. In addition to the entrée, dessert and beverage of the Plus Dining plan, an appetizer per meal is a hallmark of Deluxe Dining. Three meal credits (Table or Quick Service), two snacks, and a refillable drink mug accompany this plan. Signature restaurants will take two Dining credits. My family has enjoyed this plan as our children have gotten older, eat more food, and appreciate high-quality meals. What are the Signature restaurants? Mmmmm… my mouth waters just thinking about them. Walt Disney World has about 12 Signature restaurants in the parks and resorts, each offering delectable cuisine in an upscale atmosphere that yes, you may enter with your children! While the dress code is slightly more restricted (no tank tops for men, no ripped clothing, etc), it’s pretty liberal and you and your family will feel welcome everywhere from California Grill at the top of the Contemporary Resort (beautiful fireworks viewing) to Le Cellier in Epcot’s Canada to Animal Kingdom Lodge’s fabulous Jiko to the only Signature character meal, Cinderella’s Royal Table in Cinderella Castle. Try sushi, bison, escargot or stick to some of the best filet or lobster you’ve eaten in these excellent restaurants. Your children can expand their palates or find safe, familiar favorites. We have enjoyed date nights, Thanksgiving, and week-long splurges at Signature restaurants. My children have expanded their palates and manners here, and we wouldn’t have done them without the Deluxe Dining plan. I am often asked if the Dining Plan restricts guests to certain resorts, parks, or even entrees on menus. The good news is that Disney offers great flexibility on each plan! You may use your plan property-wide and order anything on the menu! Table service meals include an entrée of your choice, any dessert and a non-alcoholic beverage. Quick service meals are exactly the same. Yes! You get dessert here, too! Hundreds of items are considered snacks. Choose wisely with a muffin or cereal and this can be your breakfast! I prefer to use my snack credits for some of the delicious treats in the bake shops, Dole pineapple Whips in the Magic Kingdom, Mickey ice cream bars, specialty soft pretzels or beautiful caramel confections in Epcot’s Germany. Well, I have more favorites, so email me and I’ll give you a run down! The Disney Dining Plans are available for on-property guests. I would love to answer your questions about the plans, restaurants or anything Disney related! Jennifer, Cheryl and I recently had the wonderful opportunity to attend the Travel Agent Education Program for EarMarked agencies at the Walt Disney World Resort in Orlando. We were engaged in five days of classroom training, many Resort Site Inspections, park tours, a Cirque du Soleil treat, and one very special day inspecting every little bit of one of Disney’s newest cruise ships, the Disney Dream! This beautiful vessel was in port between cruises and we had the run of the ship. We were divided into five small groups and led on tours by experts who know the Dream well. It was a Dream come true! The Dream, launched in 2011, and the Fantasy, launched in 2012, are sister ships which currently sail on three and four night voyages to the Bahamas (Dream) and seven night voyages to the Eastern and Western Caribbean (Fantasy) out of Port Canaveral, FL. All cruises include a stop at Disney’s fabulous private island, Castaway Cay! We were able to view almost every single category of stateroom on the ship, which kept us hopping! The first thing you’ll notice about Disney Cruise Line’s staterooms is that they are larger than the industry average. Almost every category (except very few Standard Inside Staterooms) has highly-prized split baths with two sinks, allowing two people to get ready at the same time. Beds are raised off the floor to allow suitcase storage underneath the bed—genius! Bunks drop down from the ceiling with your steward’s assistance; you’ll never see that bed during the day. 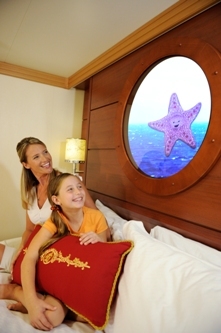 Even Inside Staterooms have Magical Portholes which give guests a video view of what is going on outside the ship! We actually saw, and loved, a little-known stateroom category that is almost two staterooms in one. A family of up to five people could really spread out in this specific Deluxe Family Oceanview Stateroom. There aren’t very many of these treasures, so ask us about our favorite find when we talk to you about your cruise! Many of our families have asked about—and stayed on—the Concierge Decks of the ship. There are so many advantages of staying on Decks 11 and 12 that we consider them a significant value. Whether you choose a Concierge Family Oceanview Stateroom with Verandah, a One Bedroom Suite with (huge!) Verandah, or the luxurious Concierge Royal Suite with Verandah, you will experience the ultimate in cruise service and luxury in these categories. You will have EARLY booking privileges with a pre-cruise Concierge for excursions, dining reservations at Palo and Remy, and kids’ clubs. A phone call will take care of it all! You will also enjoy a select, private cruise check-in area at port where you may board the ship any time you like and priority disembarking/embarking at every port and return to Port Canaveral. These are huge advantages! Onboard, you will find your deck at the top of the ship with a private lounge and sundeck reserved for Concierge guests. We were ready to set sail when we saw these rooms! Another area that highly impressed us was Senses, the onboard Spa and Salon. It is gorgeous! We relaxed the moment we stepped into the area. Besides a huge fitness room, every spa treatment you can imagine, a relaxing sauna/steam/solarium, a beautiful salon to get you ready for your dinner date at Palo or Remy, Senses has Chill, something we had never seen on a ship. Chill is a spa specifically designed for teens. It was fabulous! Speaking of teens, Disney has definitely thought of them with Vibe, a teen-only space featuring plenty of indoor and outdoor games, a soda shop, a sun deck and water area that we agreed our teens would enjoy. There was even a tween club, Edge, for kids aged 9-13. 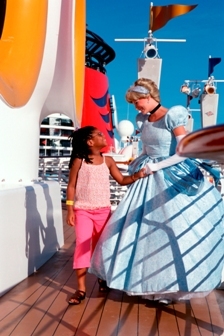 Of course Disney has world-renowned Kids Clubs on the ships! The Oceaneer Club and Lab were so cool. We moms especially loved the innovative and required hand-washing station at the entrance to each Club. 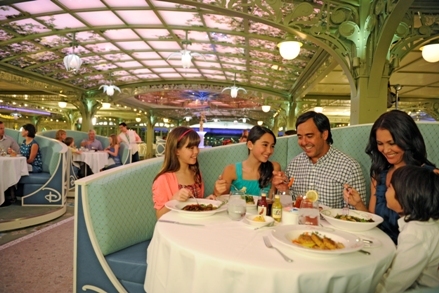 Of the three spectacular themed rotational dining restaurants every family experiences on the ship, we agreed that Enchanted Garden was our favorite. Oh, we loved the innovative and creative color-changing Animator’s Palate and the completely majestic Royal Palace, but the Enchanted Garden simply won us over by taking us to Disney’s interpretation of a day in the French countryside. We were fortunate enough to dine in one of the Dream’s lunch spots, Cabanas, and totally ate our fill at this delicious, varied buffet! Palo and Remy are the Dream’s adults-only reservations-only restaurants. They are open for dinner and, at Palo, brunch. I have dined at Palo and can assure you the food and experience is divine. Each restaurant has a slight upcharge but they are well worth it! We felt right at home in the District, the five-nightclub area that’s another adult space. The Walt Disney Theatre is the nightly home to world-class musical productions. Our guide told us that each show is in development for two-and-a-half years before performers actually take the stage! Disney wants everything to be perfect for guests. I love the way Disney engineered the ship to have spaces for adults, children and families! 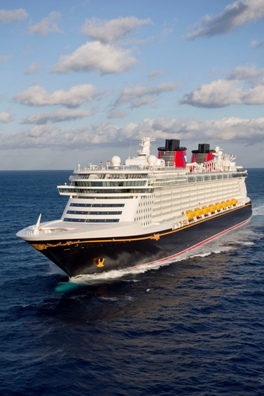 In fact, we learned that a significant number of Disney Cruise Line passengers are adults traveling without children. That speaks to the high level of quality and service passengers find on a Disney cruise! The only thing missing from our day on the Dream was that it was just that—a short day instead of an actual vacation. We can’t wait to return with our bags and sunglasses to experience a Dream itinerary! Any of our knowledgeable FTM Travel agents would love to help you set sail aboard one of Disney’s four ships. If we’ve piqued your curiosity, contact us today! Have you heard the buzz? That Walt Disney World Resort ® vacation you took two years ago may need a tune up! New attractions, resorts, and guest experiences are popping up all over Walt’s forty-seven square miles! Are you ready to explore Disney with the BEST tips and tricks under your belt? Let’s walk through a Walt Disney World vacation, from initial planning to traveling, as I do when I travel there myself. The first time we took our oldest son to Disney World I studied every book, article, message board, website, and anything else I could lay my eyes on to feel prepared for what seemed the overwhelming process of having a successful Disney World trip. I am a planner by nature so this was F-U-N for me. My husband and I also had no intention of waiting to eat or standing in lines to ride so I knew my work was cut out for me. I spent a LOT of time on my research, but we had a fantastic trip. Since then, I’ve been with anywhere from two to twenty people, family and friends, (aged) infants to age eighty five. I’ve gone at all seasons with all sorts of crowds and almost every type of weather you can imagine. Disney is my family’s happy place and it can be that place full of happy memories for your family, too. I recommend enlisting the help of a travel agency that has achieved the designation of Authorized Disney Vacation Planner. Travel agents within the agency will have extensive knowledge of Disney Destinations. Your agent will not charge you one penny to research and book Disney resorts, vacation packages, or discounts. He or she should also arrange your complimentary ground transportation, re-book your vacation should a better rate appear, and make all of your Disney Dining reservations for you. Don’t hesitate to ask these questions before you establish a relationship with your travel agent! You may prefer to do your research and planning yourself and that is certainly an option. The first question I’m always asked is: When Should We Go To Disney World? Well, my quick answer is to go when children are in school! I know! Principals probably hate me but I at least encourage families with infants, toddlers and preschoolers go while schools are in session. Why? Well, like most resorts, the Disney property rates are divided into Seasons based on popularity. So many families visit The World during school vacations that these are typically the higher rate (Peak, Holiday) Seasons. Disney has Value and Regular seasons, with the best rates of the year falling in late August/September, early December, and January. These are also the optimal vacation times, with lowest crowds as a huge bonus. Other lower crowd-great rate times to go include October, February, and mid-April-early June. To entice your family to visit The World, Disney also continues to offer a variety of resort and vacation package discounts throughout the year. What about those resorts? Disney World has 24 resorts, including eight Vacation Villa properties, for you to choose from. From 260 sq. ft. Value resort rooms that rent for as little as $85/night during Value season to huge three bedroom Grand Villas and even luxurious 2 BR suites at Deluxe resorts for up to $3000/night during Holiday weeks, Disney truly has something for everyone in on-property accommodations. The newest option, Disney’s Art of Animation Resort, features 864 standard Value guest rooms and 1,120 family suites that sleep up to six people. Disney is finally getting the hint that larger families on a budget need on-property accommodations too! For the ultimate in convenience, check out Bay Lake Tower at Disney’s Contemporary Resort. These Vacation Villas are thisclose to the Magic Kingdom and feature kitchens, washers and dryers, and up to three bedrooms. People ask me how far in advance they should book their vacation and are often surprised by the answer. Generally, I encourage families to reserve their vacation package or room-only reservation as soon as they know their vacation dates. Why should they do these/this six months to a year in advance? No one likes to be disappointed and Disney’s 24 Resorts and Vacation Villa properties often sell out well before travel dates. A $200 deposit is required to hold any vacation package with the balance due 45 days before travel. For a Room Only reservation, payment of one night’s stay will hold your room until you check in. No matter what, you may add your theme park tickets and a Disney Dining Plan to make your vacation as seamless as possible. For my family, the Disney Dining Plan has always made sense as we enjoy the variety of one table service meal, one quick service meal, and one snack credit per person per night of our stay. It saves us money and we know what to expect before we leave home. A vacation package will include your accommodations, theme park tickets, and one of three Disney Dining Plans if you choose to include it for the length of your stay. Everyone in a room must be on the same package. For a Room Only reservation, each component is separate but park tickets and the Dining Plan may be added. Any stay in an official Walt Disney World® Hotel also provides your family free ground transportation to and from Orlando International Airport, free transportation throughout Disney property, and all-important access to the Extra Magic Hours benefit available only to resort guests. Disney-themed rooms, pools, restaurants and quick park access provide even more reasons to stay in the middle of the magic. You’ve heard about those fun character meals? Well, you or your travel agent can make reservations for any of thirteen meals with a variety of Disney classic characters, beloved Princesses, or preschooler favorites up to 180 days in advance. Believe it or not, many of these reservations fill up six months ahead of time! Therefore, as soon as you’ve chosen and booked your resort accommodations, make those dining reservations! Now that you’re set to go, let’s talk about the real magic: the theme parks. Disney World has four major theme parks, two water parks, and one nighttime shopping and entertainment complex, Downtown Disney. While Blizzard Beach and Typhoon Lagoon are excellent water parks well worth your consideration, we’re going to focus on Disney’s main theme parks and how to maximize your time there. The Magic Kingdom is where it all began. Some people even refer to this original park as “Disney World.” I know I am home when I see the Magic Kingdom’s icon, Cinderella Castle, reaching for the sky. Here you will find thriller attractions for older kids (Splash Mountain, Space Mountain, Big Thunder Mountain Railroad), classics for everyone (The Haunted Mansion, Peter Pan’s Flight, Mickey’s PhilharMagic, It’s a Small World), precious starters for little ones (Dumbo’s the Flying Elephant, The Many Adventures of Winnie the Pooh, Buzz Lightyear’s Space Ranger Spin) popular characters (Mickey Mouse, Goofy) and plenty of Disney Princesses. This park has just completed the biggest expansion in the Magic Kingdom’s 41 year history with the addition of New Fantasyland. New Fantasyland is home to two new sections of the park: Storybook Circus and The Enchanted Forest. Storybook Circus features a newly-designed Dumbo the Flying Elephant with TWO circles of flying elephants, an interactive queue area, and even FASTPASS service. We’ll get to FASTPASS in a minute. The Barnstormer and Casey, Jr.’s Splash and Soak Station share the rest of Storybook Circus with Pete’s Silly Sideshow, a big-top tent where you’ll find your favorite Disney characters. You can also catch the Walt Disney World Railroad in Storybook Circus. The centerpiece of New Fantasyland and the heart of the excitement at The Magic Kingdom is the Enchanted Forest. Belle and Beast have a new home in the impressive Beast’s Castle, which stands in the distance. Belle’s village is home to the enormous, breathtaking Be Our Guest restaurant, which serves Quick Service meals at lunch and becomes a Table Service restaurant in the evenings. Belle also has her own attraction, Enchanted Tales with Belle, where guests of all ages are invited to participate in a magical re-telling of the Beauty and the Beast story. Gaston has his own tavern, too! Near Ariel’s castle, guests can board Under the Sea—Journey of the Little Mermaid for a ride through the Little Mermaid story. Meet Ariel, too in her new Grotto. She’s back in her fins! How will your family manage to see all of the attractions in this, or any, Disney theme park in one day? Well, I DO recommend you spend one day in each park plus an extra day in the Magic Kingdom (especially if you have little ones) if you can, but to maximize every moment, you’ve gotta use FASTPASS. FASTPASS is Disney’s free (!) way to collect return appointment times to many of the most popular attractions in (each of) the four parks. Here’s how we do it. Arrive at the park at least 15 minutes before it opens. You will thank me for this head start tip! Elect one member of your group to be your FASTPASS runner and give that person—an adult, please—all of your park tickets. That runner will go to your favorite attraction, place your passes in a little machine and receive FASTPASS tickets (a one-hour return window) for everyone in the group. The rest of you should meet that runner at another attraction and enjoy it together. As soon as your one hour return window opens up, go to your FASTpass attraction and find that short line! It’s as easy as that! Then have your runner FASTpass another attraction and so on throughout the day. It’s that simple! Disney is smart enough to place attractions for all ages in each of its four parks so I have a hard time steering families to a specific park as age-appropriate. Epcot is wonderful! Besides the spectacular Soarin’, Finding Nemo, and Innoventions, everyone except the very youngest visitor will marvel at the newly re-imagined Test Track. Now featuring interactive guest experiences and a cool nighttime setting, Test Track will give all guests the opportunity to design, then test, their own GM car! Yes, it has FASTPASS! World Showcase continues to be the only spot where you can show kids the world in a one mile tour. The new Agent P (from Phineas and Ferb) Adventure will give them a chance to explore one country while playing detective. Disney’s Hollywood Studios brings the movies to life! From Hollywood classics to Pixar hits of today, The Studios can give families a ride on a fabulous coaster featuring Aerosmith, take target practice in Toy Story 3-D Mania, and play with their favorite characters in Disney, Jr., Live on Stage. It’s also THE place to be transformed into a Jedi warrior and actually fight Darth Vader and spend time in the NEW interactive Legend of Captain Jack Sparrow show. Pixar movie characters will greet and pose for pictures with your child all over this park. I’m often asked about my favorite Disney attraction. Well, it’s right here: Hollywood Tower of Terror! Yes, it’s a thirteen-story drop with the best themeing in The World! There are some fun places to eat here, too. Dine in a convertible in a drive-in theater or step back into a 50’s diner for some immersive experiences. Finally, Disney’s Animal Kingdom is a crowning jewel in Imagineering. The Tree of Life is an incredible icon of carved animals that showcases Disney’s passionate commitment to wildlife. The center of this park is Kilimanjaro Safari, a 25 minute ride through a true African habitat. You’ll see dozens of species, many exclusive to Disney in the USA. Take the safari in the morning and late afternoon (FASTPASS) to catch a glimpse of different animals. The biggest thrill in this park is a terrific coaster called Expedition: Everest. Well-designed to make you feel like you are in Nepal, this ride leaves you wanting more. Two amazing shows also dot this park. Don’t miss the Broadway-quality Festival of the Lion King or the Finding Nemo show! The more my family visits Animal Kingdom, the more we love it! I hope I’ve whet your appetite to take a trip to The Happiest Place on Earth. Disney World truly has something for all ages and budgets and I hope that your family, like mine did, will step in and see that magic is alive and well in central Florida. 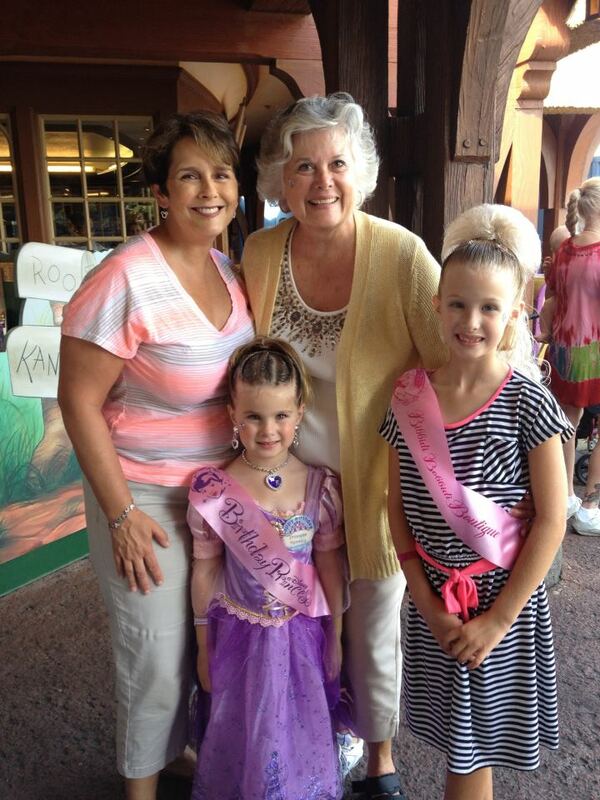 Jami Hill is a Tennessee mom and Fairy TripMother. 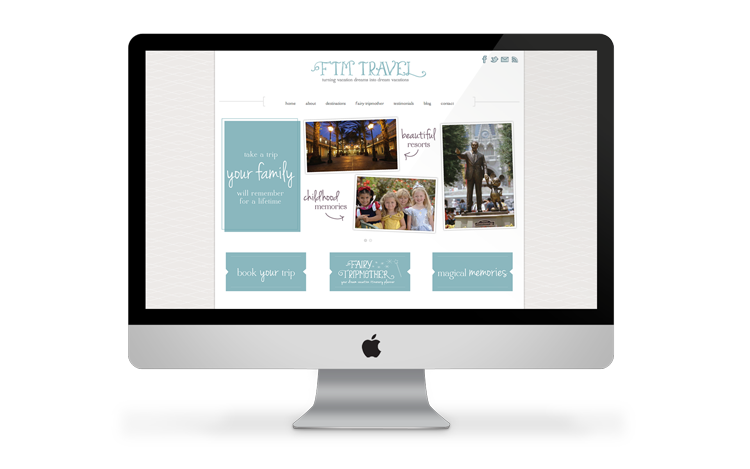 She is co-owner of FTM Travel, which has achieved the designation of Authorized Disney Vacation Planner. You may reach her at jami@fairytripmother.com. At last count she had visited Walt Disney World 33 times.